Famous chefs can be great role models for students who have an interest in the culinary arts field. Because of television, shows like The Food Network, PBS and The Cooking Channel, students have access to culinary information, competitions and cooking personalities at the click of the remote. The goal of this project is to help inspire students and advance their culinary skills and knowledge by learning more about these famous chefs. Option #1: Divide the class in half and play a quick round of Family Feud with this prompt: Name a celebrity chef you’d want making dinner for you every night. The answers used were Emeril Lagasse, Rachel Ray, Bobby Flay, Gordon Ramsay, Paula Deen, Jamie Oliver, and Wolfgang Puck. Option #2: Use technology and play the famous chefs trivia game via Sporcle found here. Begin by having students choose from a predetermined list of famous chefs. There are many to choose from on this website and background and biography information for each chef is also provided. Facts of life such as occupations, birth/death dates, education, successes, etc. Copy and print the apron template (adjust size if necessary) and give students pre-cut construction paper strips ( approximately 5/8″) along with glue and scissors. Cut a slit at the top of the apron and insert the head shot of your chef. Add the name of your chef to the front of the apron with a marker. 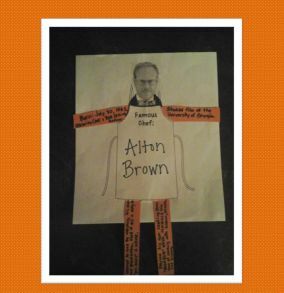 Add information from above to construction paper strips that will become the arms and legs of your chef. Glue strips to your apron. Create a fun bulletin board of your student chefs by having them insert their own photo as the famous chef. They can add their own information as it pertains to their age, cooking ability, specialty foods, etc. I like this plan and the resource link to Chefs. I plan to use this lesson next week!